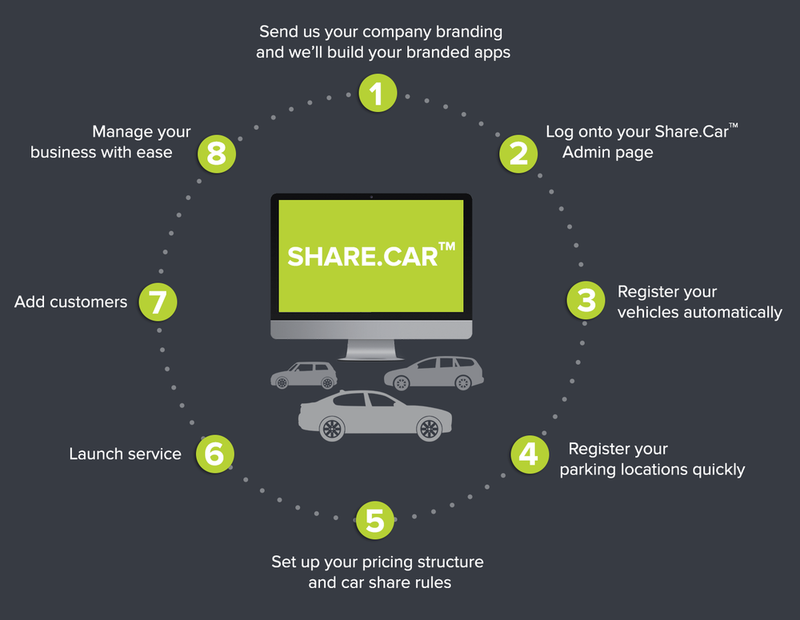 Share.car is our car share booking platform built for all forms of station-based car sharing. Share.car contains all the elements that a Car Share Operator (CSO) needs to run a successful car share operation. Our intuitive platform allows the CSO to easily manage rates and fees, approve customers, check driver’s licenses, issue and refund invoices, track fleet usage, add cars, manage damage, set taxes and monitor the performance of the fleet. Through the Share.car community function the CSO can restrict car access to specific groups or open the fleet up to everyone with the app. The system is designed for Residential, Campus, Corporate and City car sharing and allows a car share fleet to be subdivided in whichever manner best suits the CSO. Our SaaS platform is designed to get you started quickly as a fully-fledged car-sharing operation. From contract signing we will have you up and running in a matter of weeks; with unique mobile apps branded with your companies colors and logos, in-car hardware set up and a back-end system all ready to go for you to manage your customers and fleet. If you are an established CSO business and feel your current software solution isn’t quite right or a car rental company looking to diversify your business, we have advanced data migration techniques to easily port your existing user and booking data over to the Share.car platform. Want to learn more about SHARE.CAR ?